This week two women became the first females ever to graduate from US Army Ranger School. I saw extremely tough men fail out of this course when I went through with class 11-89. I wonder how many times someone told them they can’t do it? 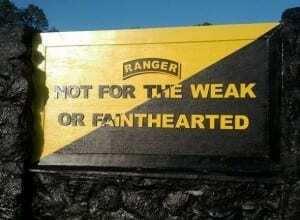 Here is a picture of the sign at the entrance to Ranger School, Fort Benning, GA. Nothing motivated me more as a young man than someone telling me what I can’t do. As a business owner and entrepreneur I frequently encounter nay-sayers, statisticians who aren’t in the game, and people with jobs that don’t understand my unique passions/dysfunction. I intentionally spend quality time every week with other crazies; SMART PEOPLE with BIG IDEAS who know about being all in. Starting and growing businesses is “Not for the Weak or Fainthearted” either. Ninety-four men graduated too. Congratulations to all who wear the coveted Ranger Tab. Rangers Lead the Way! !